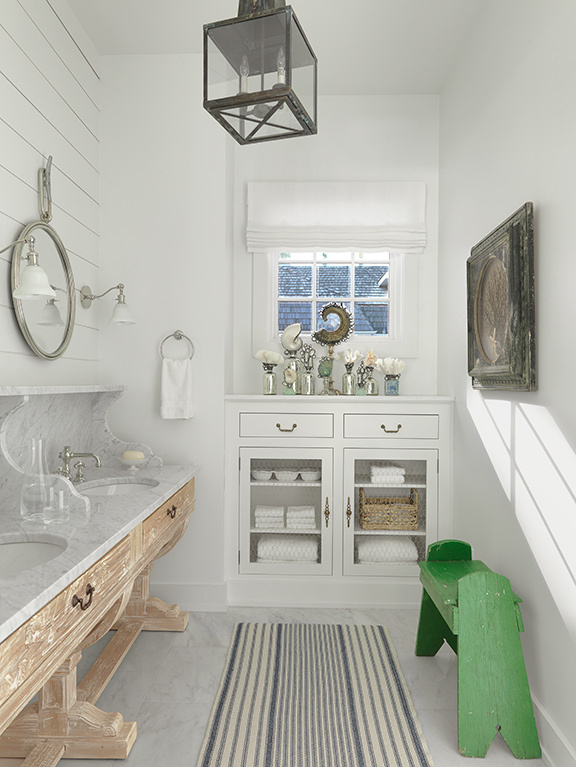 Coastal charm combined with plenty of space for guests was the request for this 166-square-foot guest bath designed by Amy Studebaker Design. 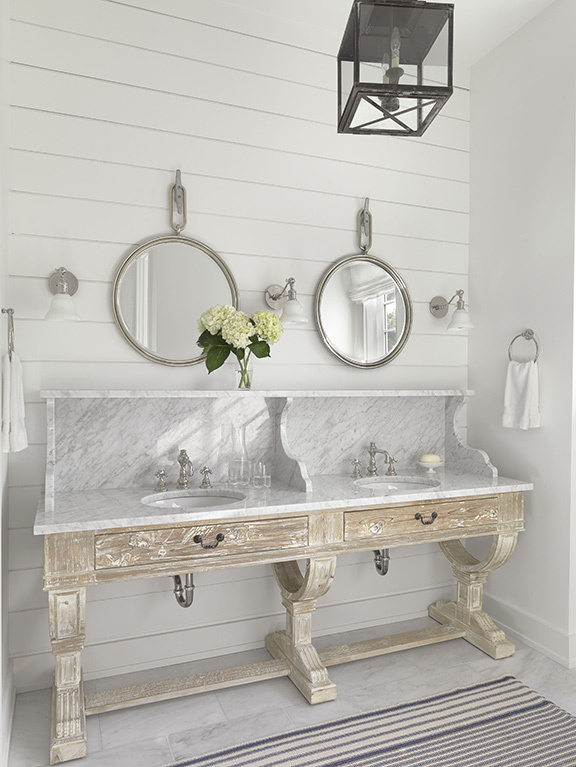 A sofa table found during a buying trip down south inspired the bathroom’s overall design. Wanting to use a piece of furniture for the vanity to bring warmth and interest to the space, the designer was inspired to create a custom vanity reminiscent of old washstands. 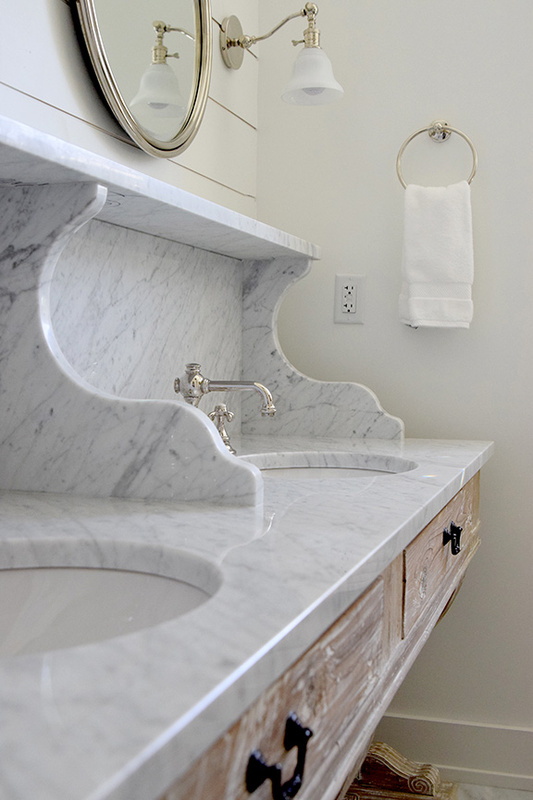 A simple, elegant top portion features corbels and a shelf. For added storage for towels and guests’ items, the designer created a built-in cabinet with chicken-wire door fronts, which brings a causal element while also adding texture. To achieve the casual, thrown-together look, smaller round mirrors and simple sconces mix with the larger, taller washstand. The coastal ambience is brought to life with the use of shiplap, round port-hole-like mirrors and a navy-and-white ticking stripe dhurrie rug. Other charming accents include a vintage green stool, collection of glass bottles with shells as toppers and, as with any true classic Nantucket space, a lantern hung from the ceiling to softly light the space. Why the judges love it: This high-end, yet vintage-y space is bursting with texture and shape. The individual elements are so well thought out and combine to make the whole room feel warm and natural.